I was really craving something deliciously chocolate-y the other day but didn’t want all that butter, sugar, and fat. And I wasn’t sure if I wanted cookies or brownies (yeah, I’m indecisive) so decided to combine the two with an egg-free and semi-healthy recipe that totally took care of my chocolate craving. And this recipe is so easy your kid can make it. Really. Mine basically did. Measure and add all the ingredients to a mixing bowl and stir until incorporated. While you are getting things ready, preheat your oven to 350˚ F and line an 8×8 inch baking pan with parchment. Pour the batter into the prepared pan and spread, creating a nice and even layer of goodness. When your oven is ready toss the brownie cookie bites into the oven. 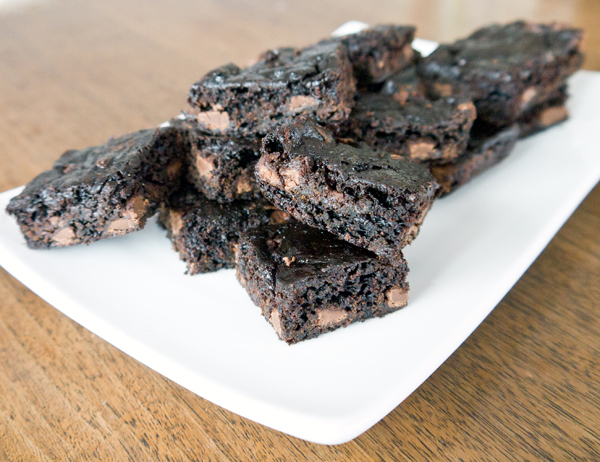 For really fudgy bites, bake for 12 minutes. 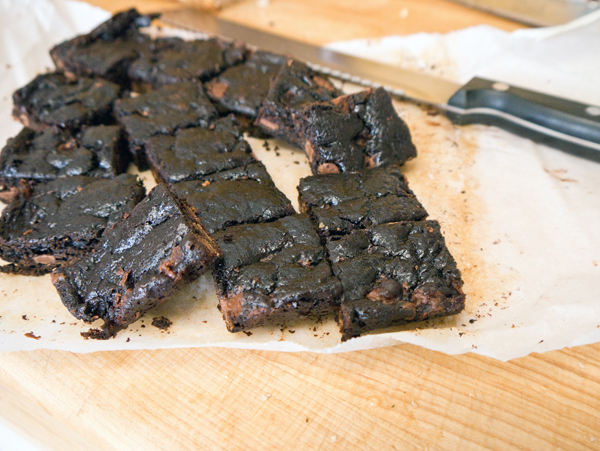 For a crisper crust, and a nicely set brownie cookie, leave in the oven for around 18 minutes, which what I did. Remove and let come to room temperature before even touching them. These bake wonderfully, but if you try to cut them right now, they’ll be a big melty mess. Yes, a big melty mess is still wonderfully tasty, but your brownie cookie bites will resemble a warm baked pudding more than a crisp and gooey brownie cookie bite if you cut them fresh from the oven. After around 30 minutes, remove from the pan with the help of the parchment paper and cut into small squares. Depending on how big you like your brownie cookies will decide how many you get from the pan. I think we cut around 20, but ate at least four right away. 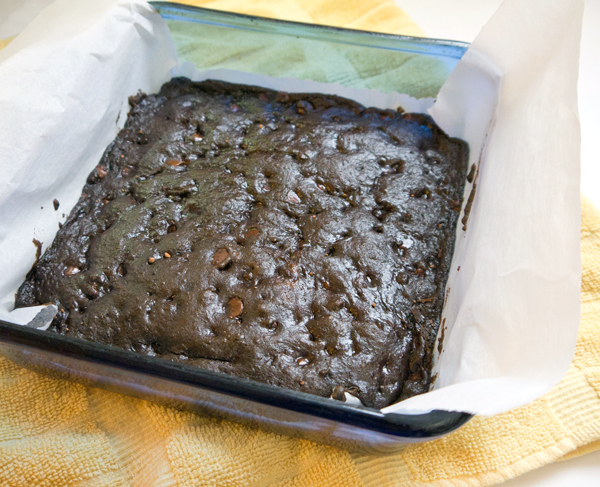 I’ve experimented with healthy brownies in the past, and these totally won out on flavor and gooey factor. And you can make them even healthier by using whole wheat flour and swapping a banana for the veggie oil (they just might be a bit denser with a touch of a nana tang).